It's been a long time since I had fun with ice cream, actually, technically, sometimes I forget to post my fun. Ice cream art is fun...but when you're media is melting quickly, and not real tough, well it doesn't always come out right. Today, may I present, the yogurt castle! 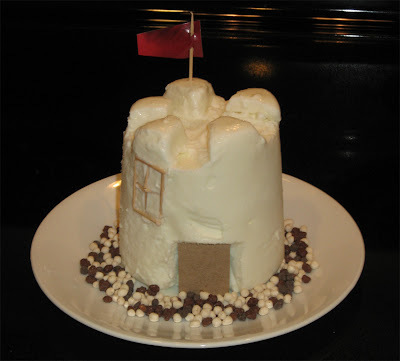 It's a vanilla yogurt castle with a Crunchy moat. Ice cream art is fun, but I need to learn to plan ahead more (especially with quick melting yogurt). The window's a bit big, and the castle door should be more official, but yeah, it was all spur of the moment.